The I-4 Ultimate Improvement Project has developed procedures for submitting claims for property damage to vehicles while traveling on Interstate 4 (I-4) and other nearby roadways that are part of the construction project. What do I do if construction activities, vehicles or materials damage my vehicle? The very first thing you should consider obtaining is a police report. This helps with the legitimacy of the claim. When a roadway is under construction, the contractor indemnifies the state from responsibility for any such claims. 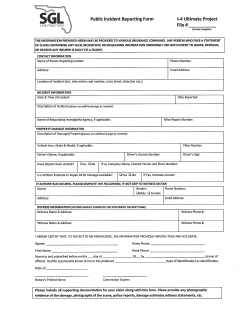 The contractor requires claimants to fill out an I-4 Ultimate public incident reporting form. A police report is not required to submit a claim, however it can be beneficial when evaluating the claim. Include with the form a copy of the police report, location and description of the incident, any pictures you may have of the damage or of whatever may have caused the damage, and a cost estimate for repairs. It is advisable to supply as much information as possible. Is there a fee for filing a damage claim? Can all claims be filed with the I-4 Ultimate project? Damage claims occurring within the construction areas of the project can be submitted to the I-4 Ultimate project. Damage claims on roadways not in the construction area of the project should be referred to the government agency that maintains the roadway. SGL — the joint construction venture of Skanska, Lane and Granite on the I-4 Ultimate Project — its insurance carrier evaluates each claim. Upon return of the claim form and required documents, a project investigation will begin. Acceptance of the claim form is not a guarantee that a claim will be paid. Each claim is reviewed individually and is accepted or denied based upon the facts and circumstances related to that claim. While every effort will be made to expedite the processing of each claim, final determinations are generally made within 120–180 days. Please contact your insurance agent if the damage requires urgent consideration. The insurance company can arrange for repairs and present a claim to the project on your behalf. Is the public incident reporting form only for vehicle damage? No, use the same form to report damage to a property or building. The incident form is a standard form, so some fields may not apply to your situation. Do you have to mail in the form?